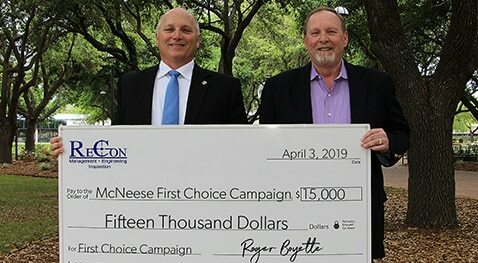 ReCon Management Services Inc. has donated $15,000 to the First Choice Campaign underway at McNeese State University. 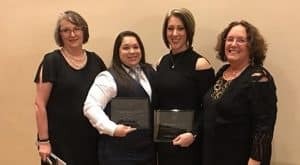 Local industry partners and contractors are investing in McNeese and the future of Southwest Louisiana through the campaign, a three-year initiative with a goal of raising $1 million per year for the next three years. This commitment from ReCon Management Services will provide necessary resources to sustain growth in high demand academic areas in support of the economic expansion in Southwest Louisiana. On hand for the presentation are McNeese President Dr. Daryl V. Burckel, left, and Roger Boyette, president of ReCon Management Services Inc.